"Shooting Gallery" is the debut CDEP of this quartet from northeast Ohio on their own Davenport Records label. Yep, davenport (which means sofa in this part of the country, though only my grandmother actually uses that term), probably the place where one lazy day the four comprised the idea of starting a band, and then a label. I'm glad that they chose to be spacerockers anyway, as if they'd been watching MTV all that time on the sofa, they'd certainly have aspired to be the next Matchbox 20 and what a waste that would have been. Channel is a band with several disparate styles of cosmic rock... one a slow, thick and dreamy mishmash along the lines of My Bloody Valentine, the other a more frenetic, heavy riffing variety. This is demonstrated at the outset of "Shooting Gallery," beginning with the shoegazer anthem "Masseuse" which segues quickly into the lone true rocker "Downpour." The latter track has a variety of pace and dynamics, however, and tells me early on that their songwriting is already beyond a simple stage. The title track takes things back down to a subdued level, where Darren Thompson's echoey guitar sounds cascade around Kramies Windt's vocals. "Orange Roughy" has a peculiar retro-psychy flavor to it, but the tune is really a 6/8 slow dance number. "Everything So Plain" is a more schizophrenic tune that works in creating a mood on several levels, and despite a few rough spots, drifts off into a pleasant upwardly-turned finale. The disc wraps up with "Oceans", which again uses extremes in dynamics, at one point lulling you in a state of total serenity, only to then shake you out of it with a smattering of power chords. 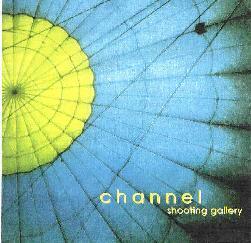 Channel is another band who reside equally in the years 1970 and 2000, with the question being where will we all be in 2010? I think as the band matures, they may have something to say about where to go next. As of now, I feel the band's sound is a tad rough around the edges, but still contains a lot of promise. Though I'm not so sure I like Windt's voice too much, though I can't really say what I dislike about it either, other than it has an odd quality to it that I can only refer to as a 'twang.' But then it always takes me longest to get used to unusual voices than anything else in music, so time will tell in that department. You can visit Channel at their web site.